I think I must have gotten over my fear of snakes, because this really didn’t scare me in the slightest. 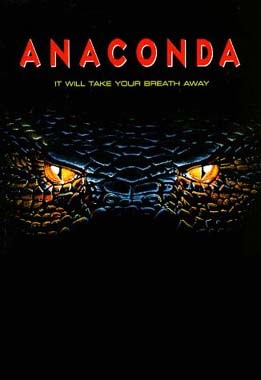 I watched Anaconda many, many years ago and I remembered it as being much scarier … but either my memory is faulty or I’m a lot more jaded than I once was. The only scary thing was Jon Voight’s performance and that terrible accent. But it was quite interesting to see J.Lo and Owen Wilson in a horror movie. If you want to watch it, I would suggest keeping your brain out of it. It’s good for some mindless entertainment. You know I have never seen this movie. I guess I should change that. I don’t understand other people’s fear of snakes in the least. I have my weird fears, but I love snakes. A giant anaconda would make me scream “COOL!” rathner than in fright! J.Lo has made so many bad movies….